The most interesting redactions in the entire Mueller affair are these, signifying as they do the tenor of President Trump and his administration. Such language was already in Use in Nixon’s Oval Office (and no doubt before), and the words “expletive deleted” were familiar to me from that era in some ways so parallel to our own. “Redacted” however is the word bandied about in our own day, and it took me a while to realize that all those asterisks in fact represent “expletives redacted”..
Descendit ad inferos, he descended to those below..
Now that he ascended, what is it but that he also descended first into the lower parts of the earth? He that descended is the same also that ascended up far above all heavens, that he might fill all things. This worldly world is no place into which such doctrines comfortably fit. Hell? The lower parts of the earth? No, there is a low doorway by which we may enter such a cosmos, encounter such a Christ. We must shed, in fact, reality and self-importance, twin delusions, and embrace imagination. rest well and bring me also to peace! opens heaven for me and closes off Hell. The Latin of the Apostles’ Creed does not actually say that Christ descended into hell, but that he descended to those below, and this in turn is interpreted to mean that he came to those of good character who died before his coming, and were thus unable to hear the gospel he preached until this Holy Saturday — his body in the tomb, his presence preaching to them for their salvation. We are thus offered a neat answer to the otherwise tricky question — what happened to those who, through no fault of their own,never heard him. For Christianity, this is the archetypal liminal moment, this day between crucifixion and resurrection, death and renewed life. How unimportant it seems, how humble, falling between Good Friday and Easter Day — yet there is beauty here, as the whole gospel story is beautiful. But there is more. It is characteristic of the Passion story that Christ touches the depths of human doubt on the cross — crying My God, my God, why hast thou forsaken me? I am no wino or pishko, but I am no saint either. A medicine man shouldn’t be a saint. He should experience and feel all the ups and downs, the despair and joy, the magic and the reality, the courage and the fear, of his people. He should be able to sink as low as a bug, or soar as high as an eagle. Unless he can experience both, he is no good as a medicine man. Ifb you have not suffered as deeply as those who come to you with their sufferings, you will seem shallow to them, and be unable to console them. If youhave not experienced joy as fully as those who rejoice nearby, you will seem stiff and stilted to the, and cannot join thewir dance, their song/\. Christ on the cross, Christ in the tomb descending to those below — bith are instances of that same descent which is the natural accompaniment of sacent — just as Chrust’s birth in a stable — no room at the inn — is the descen to vulnerable humanity of Godhead impassible — beyond all suffering. It is in the descent that the ascent is prepared. Although this happy night brings darkness to the spirit, it does so only to give it light in everything; and that, although it humbles it and makes it miserable, it does so only to exalt it and to raise it up; and, although it impoverishes it and empties it of all natural affection and attachment, it does so only that it may enable it to stretch forward, divinely, and thus to have fruition and experience of all things, both above and below, yet to preserve its unrestricted liberty of spirit in them all. And the way up is the way down, the way forward is the way back. I have written this post, this day, to teach myself these things, to do the necessary research, the discovery and the remembering: and I hope they will be of interest and profit to you too. But I must post in haste — Easter Day approaches, and with it the joyful cry, Christ is risen! Christos aneste. Mueller Investigation Report, Volume II: Obstruction of Justice. 7. During the campaign, Trump repeatedly denied links to Russia, denied that the leaks were coming from Russia, and denied that he or other campaign officials sought any information from Russians. As my previous thread shows, the Mueller team found these denials to be false. Trump proceeded to ask Deputy National Security Advisor McFarland for a letter saying that Trump did not order Flynn to meet Kislyak. McFarland declined because he did not know if it was true and didn’t want that to look like a quid-pro-quo favor for his Ambassadorship. 12. Later, when Comey admitted that there was an FBI investigation on Russia, Trump reached out to National Security Advisors asking them what they could do to dispel this suggestion. Despite McGahn’s advice to the contrary, he also reached out twice personally to Comey. 13. On May 3, Comey testified in a congressional hearing, refusing to say that Trump himself was under investigation. Within days, he was terminated. Trump claimed that the termination was unrelated to the testimony, but the timeline does not bear this out. 15. Trump then argued that Mueller had a conflict of interest, but his advisors told him that claim was meritless. 16. When Mueller announced that Trump was a target, the latter called McGahn at home and asked him to fire Mueller. Fearful of starting a Saturday Night Massacre, McGahn resigned, instead. 17. Two days after the convo w/McGahn, Trump met with Corey Lewandowski, asking him to relay a message to Sessions, who as you recall had recused himself. 19. Lewandowski told Trump he understood the message, but did not want to relay it himself, so he asked senior White House official Rick Dearborn to do it. Dearborn didn’t want to do it either and did not relay the message. 20. In the meantime, while Trump was waiting for Lewandowski to relay the message to Sessions, Trump went on a twitter tirade, criticizing Sessions and implying that firing Sessions was imminent. 21. In the summer of 2017, news of the meeting at Trump Tower leaked to the press. On numerous occasions, Trump instructed aides not to reveal any information about the meeting and expressed confidence that the information would not leak on its own. 22. When Trump Jr. issued a statement about the meeting, Trump (the father) edited out what we know to be true: that the campaign was promised incriminatory information on Clinton. The edited statement stated that the meeting was about adoptions of Russian children. 23. Trump’s lawyer subsequently denied to the press that Trump played any role in crafting or editing Trump Jr.’s statement. 24. In Summer 2017, Trump made several efforts to reach out to Sessions and convince him to “unrecuse” himself. Trump met with Sessions at the Oval Office and asked him to “take [a] look” at investigating Clinton. 25. When Flynn pleaded guilty and collaborated with the Mueller investigation, Trump called Sessions again and told him that, if he “unrecused” himself, he would be “a hero”. Sessions did not “unrecuse” himself. 26. 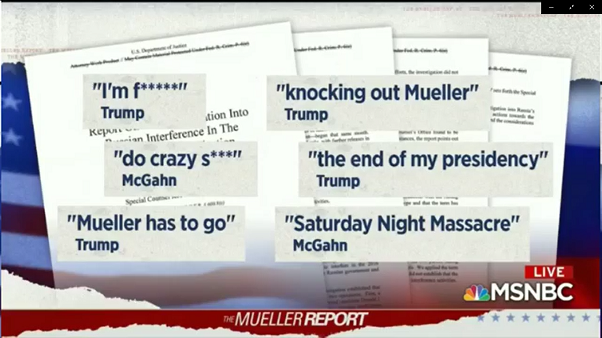 In early 2018, the media revealed the story behind McGahn’s resignation. Trump directed White House officials to tell McGahn to publicly deny that Trump had ordered McGahn to sack Mueller. McGahn refused to publicly deny this, saying that the reports were factually accurate. 29. Flynn informed Trump that he was unable to cooperate with this request. Trump’s personal counsel said he would make sure that the President knew that Flynn expressed “hostility” toward the President. 31. In 2017, as explained in Vol. 1, Michael Cohen falsely testified before Congress that Trump’s involvement in the Trump Tower Moscow project ended long before the campaign (when in fact it continued well into 2016.) Trump praised Cohen for his testimony. 32. In April 2018 the FBI raided Cohen’s home. Trump encouraged him to “stay strong” and relayed messages of support. Cohen reached out to Rudy Giuliani to discuss the possibility of a pardon. 33. When Cohen started cooperating with the investigation in Summer 2018, Trump turned on him, called him a “rat”, and suggested that his family members had committed crimes. 34. We now turn to how the Mueller team analyzed whether these facts constitute Obstruction of Justice. 35. Obstruction of Justice has three elements:  an obstructive act  a nexus between the obstructive act and an official proceeding and  a corrupt intent. 36. The offense covers both successful endeavors and attempts to obstruct justice. 37. The report enumerates the people they questioned in connection with the report. It explicitly says that “The President declined to be interviewed” and there are redacted bits around this statement. 39. In deciding whose version was credible, they relied on general principles, including reasons to lie, good memory, opportunity to observe events, corroboration, and contradictions. 40. The part of the report that discusses Trump’s reaction to the Russian hacks and his instructions to Cohen and Manafort in this respect is heavily redacted. 41. Trump reached out to the intelligence community asking them to publicly deny the Steele Memo after it leaked through Buzzfeed. 42. We now move on to the Mueller team’s conclusions about whether Trump’s behavior constituted obstruction of justice. 43. Regarding Flynn’s resignation and pressure on Comey: Trump’s effort to procure false reports about Flynn, and especially the 1-on-1 convos w/Comey, count as “obstructive acts”. 45. Corrupt intent: Trump’s demeanor in pressuring Comey suggests he knew he was not doing something that was above board. => OBSTRUCTION OF JUSTICE. 46. Regarding the pressure on Comey and others in the intelligence community to end the investigation: Trump’s convos about this, through McGahn and others, were not interpreted as inappropriate efforts to end the investigation. 47. There was a nexus to official proceedings that would follow disclosures about the involvement with Russia. 48. The nature of the pressure on intelligence officials does not clearly reveal corrupt intent. => NO CONCLUSIVE OBSTRUCTION OF JUSTICE. Read on. 49. Re firing Comey and claiming it was unrelated to Russia: This would qualify as an obstructive act if the anticipated effect was ending the investigation, which is unclear here. 50. Nexus: There is some connection this is related to the proceedings against Flynn. 51. Corrupt intent: The evidence supports the idea that the firing was aimed at protecting the president and that the other reasons were merely pretextual. => IF NOT “OBSTRUCTIVE ACT” THEN DOESN’T RISE TO LEVEL OF OBSTRUCTION OF JUSTICE. 52. Re the efforts to remove Mueller through McGahn and others: This is clearly an “obstructive act” to terminate Muller. 53. Nexus: There is a clear nexus between the effort to remove Mueller and the desire to end the investigation. 55. Efforts to curtail the investigation through Lewandowski, Sessions, etc: Obstructive acts: Trump’s directives show that he was trying to push Sessions to deviate the Mueller investigation. 56. Nexus: This was directly related to the Mueller grand jury. 58. Trump’s efforts to cover up the Trump Tower meeting: Obstructive act – there’s no strong evidence that this was more than a press strategy. 60. Corrupt intent: Unclear from these facts if it’s merely a press strategy. => NO SUFFICIENT PROOF OF OBSTRUCTION OF JUSTICE. 61. Trump’s efforts to “unrecuse” Sessions and have him take control of the investigation: Obstructive act b/c clearly aimed at terminating the Russia investigation. 62. Nexus to the Russia investigation is clear. 64. Trump tries to get McGahn to lie that he wasn’t ordered to fire Mueller. Obstructive intent: Duh – he’s trying to get McGahn to create a false record. 65. Nexus: It was foreseeable that McGann would testify about these matters, so there’s a connection to the Russia investigation. 67. Trump’s statements to Flynn and Manafort in the context of the criminal proceedings against them: Obstructive act in the sense that his statements could influence the jury. 68. Nexus to both trials. 70. Trump’s about-face toward Cohen (praise then excoriation when Cohen cooperated w/the Feds.) Obstructive act: Trump knew that Cohen provided false testimony but no proof that he procured said false testimony. 71. Proceeding: Cohen’s testimony at investigations. 72: Intent: There’s evidence to support the inference that he hoped Cohen would falsely testify. => BUT NOT ENOUGH TO SUGGEST HE PROCURED THE FALSE TESTIMONY. 73: Now the report looks at these instances as a whole. The report cautiously suggests that Trump might have just been upset because the Russia investigation (which, as per Part I, stops short of arguing conspiracy) cast doubt on his legitimacy as president. 75. In general, federal law advances a broad definition of obstruction. 76. Also, other obstruction statutes might be relevant to Trump’s conduct, including tampering with witnesses. 80. Thank you all for reading along. I hope this was helpful to you. Please tweet and share in case others find this useful. I’m grateful to Thread Reader, the application which makes extensive Twitter threads like this one available in easily readable, sequential form, and which was used to reformat Hadar’s threads before posting them here on ZP. One of the best uses of Twitter is to provide continuous threads by a single author on a topic of interest. Hadar Aviram, who teaches law at UC Hastings, wrote up a detailed rundown of the Mueller report yesterday evening, and released it in the form of two Twitter-threads, one for each volume. With her gracious permission, I’m reposting them here on ZP. Hadar points out that her threads mostly recount the contents of the two volumes, with only one or two of her own comments. Volume I deals with Russia’s election interference and its interactions with the Trump campaign. 1. #MuellerReport Volume 1, redux: We now know, beyond a shadow of a doubt, that the Russian government procured the outcome of the 2016 U.S. Election, in order to obtain a presidency that was hospitable to their aspirations in the Ukraine. 2. They did so in two ways: deep and sophisticated infiltration of social media since 2014, and hacking the DNCC emails. 3. The Russian hackers impersonated not only right-wing groups, but also progressive groups. 4. Many rallies throughout the US, purportedly organized by “grassroots activists”, were organized by Russians. 5. Among these dozens of rallies, the ones that stand out in particular were the ones supposedly organized by the coal industry. 7. The Trump campaign, including Trump himself, endorsed Russian political operative by retweeting their tweets and cooperating with their rallies. Unclear whether they knew they were interacting with Russians. 8. The Russian military hacked Democrat accounts in several waves, in a concerted and sophisticated effort. 9. This involved planting malware on the servers, as well as the theft of thousands of documents. 10. The GRU disseminated the stolen documents first through two anonymized accounts, DCLeaks and Guccifer, and then through WikiLeaks. 11. The Guccifer account reached out directly to the Trump Campaign offering more information, but no evidence of further communication with the campaign. 13. The GRU and Wikileaks hid their communications, so the #MuellerReport has only partial information about the transfer, but they did establish when some of the documents were transferred. 14. The day that Trump publicly said, “Russia, if you’re listening, I hope you can find the 30,000 emails” on Clinton’s server, the GRU hacked Clinton’s account. 15. The GRU also directly intervened in the election by targeting election administrators and hacking computer systems, specifically in Illinois and Florida. B/c of redactions, unclear from this version which of these interventions were successful. 16. The part about the Trump Campaign’s interest in the hacking activities is heavily redacted. Some of the redactions involve incidents mentioned by Cohen and Manafort and involving Trump personally, but too much redacted material to get a full picture. 17. Page 54: It seems like Trump and Gates were going to the airport, Trump got a call and then told Gates that more emails were forthcoming. 18. Correspondence between Trump Jr. and Wikileaks shows that they were in communication and that Trump Jr. shared their leaked emails, but falls short of showing Jr. actively asking them to do things. 20. Two of these people, Barbara Ladeen and Peter Smith, were contacted by Michael Flynn and asked to dig for the emails, and Smith even formed a corporation aimed at doing so. 21. Connections btwn Trump campaign & Russians before Nov. 8, 2016:  Trump Tower Moscow project negotiations btwn Trump and oligarchs (Crocus Group) begin after Miss Universe pageant in Russia. Last communication on this appears to be Nov. 24, 2014. 22. In 2015, Moscow tower convo is revived with communication between new investment group, and Michael Cohen, through Felix Sater. Throughout 2015 and 2016 Cohen reported to Trump about the progress of the project. 23. Btwn Oct 2015 and Jan 2016, Trump negotiated directly with the Russian Government and the City of Moscow re the tower, personally signing a “letter of intent.” In this context, Sater emails Cohen, telling him that Putin has the power to make Trump POTUS. 24. Cohen does not remember Trump explicitly discussing the impact of business on his presidency, but remembers Trump saying that the presidency will result in good business. 25. After signing the letter of intent, Klokov, an energy corporation exec, contacted Ivanka offering help with the campaign. She forwarded his email to Cohen, who corresponded with Klokov, the latter suggesting a course of action ending in a Trump-Putin meeting. 26. Klokov suggested that the Trump-Putin meeting be informal and divorced from the political issue. 27. Cohen continued pressing through the Sater channel, but his email asking for a meeting didn’t go through b/c he misspelled the recipient’s email address. 28. Cohen later resent to the correct address. He lied to congress that he didn’t get a response. In fact, he had received a response, and was still working on arranging the meeting and reporting to Trump well into June 2016. 29. Sater continued to make attempts to bring Cohen and Trump to Moscow to negotiate the tower well into mid-2016. In one correspondence item, Cohen specifically said Trump will travel after he becomes the nominee. 30. Trump himself was invited twice to Russia, once through Ivanka’s fashion connections, and ended up not going for various reasons involving the timing of the campaign and the identity of the people who invited him. 31. Moving on to outreach to foreign policy advisor George Papadopoulos. He was contacted in April 2016 by British professor Mifsud, who told him that the Russian government has procured “dirt” on Clinton. 32. Papadopoulos shared this information outside the campaign, but there is no conclusive evidence that he shared it with a campaign official, and the meeting he tried to broker never came to pass. 34. In March 31, 2016, Papadopoulos attended a meeting with Sessions and Trump (see pic), in which he informed them of Putin’s interest in meeting Trump. Trump and Sessions expressed interest. 35. It was only after this meeting that Papadopoulos learned from Mifsud that Russia has dirt on Clinton. 38. Steven Miller, Clovis, and other campaign officials deny having heard from Papadopoulos about “dirt” on Clinton. 39. Moving on to Carter Page, who joined the Trump Campaign as foreign policy advisor in March 2016, after having lived and worked in Russia and been approached by Russian intelligence years before the campaign. 42. In July 2016, Page traveled to Moscow to give a speech at the New Economic School (NES). 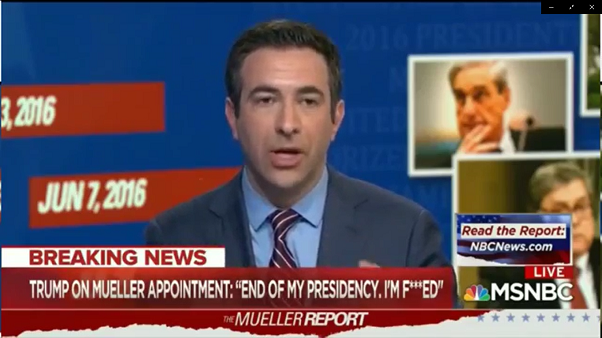 He tried to get Trump to do it in his place, but the campaign said that was not possible and that he’d have to take the trip “out side [sic] of your role” in the campaign. 43. At NES, Page spoke openly against U.S. sanctions against Russia and met businessmen and officials, leading him to email the campaign promising “a readout soon regarding some incredible insights and outreach I’ve received” from Russian politicians. 45. The negative press about Page’s trip and his subsequent meeting with Kislyak (Russian ambassador to the U.S.) led to his removal from the campaign in September 2016. 46. Moving on to the think-tank CNS (Center for the National Interest) and its presidency Dimitry Simes (USSR born and well connected to Russian politicians and businesspeople.) In March 2016, Simes met Jared Kushner, suggesting an advisory expert group. Kushner was receptive. 48. There is no evidence that Kislyak spoke directly to Trump – looks like Trump left the venue to the airport shortly after his speech. 49. Sessions was to be seated next to Kislyak, but no photographic evidence that he spoke to him at the event. 50. Kushner and Simes remained in contact until the election, with the latter advising Kushner against the “bad optics” of Russia connections and too much focus on Russia. 51. In August 2016, Kushner provided Simes, at the latter’s request, with material on Bill Clinton’s contact with Russia. Kushner thought they were “old news” and thus worthless, but Simes shared them with the think tank. 54. Kushner and Manafort were aware of the meeting and its importance. Cohen recalls Trump being told, though he does not recall he was told specifically it was with Russians. 55. Trump, Kushner, and Manafort all deny that Trump was informed of the meeting. 56. We know, however, that when Veselnitskaya did not substantiate the Clinton info and the conversation turned to the Magnitsky Act, Kushner sent a text to Manafort, saying “waste of time,” and excused himself before the meeting ended. 57. Following the meeting, there were two unsuccessful follow-up efforts from the Russian side. The American side, however, became increasingly worried re the optics of Trump Jr.’s attendance. Goldstone told Alagarov that he “kept you and your father out of it” as a “favor”. 58. There is evidence on both sides of an effort to match versions about what happened at the meeting and make it seem innocuous on Trump Jr.’s part. 60. At behest of Trump’s foreign policy advisors, the RNC platform, which originally supported “lethal assistance” to the Ukraine, was modified to “appropriate assistance.” Senator Gordon, who also talked with Kislyak at the convention, was instrumental in procuring this change. 61. After the convention, Kislyak continued contacting Sessions and Gordon, meeting the former in September. Sessions recalls Kislyak relaying his govt.’s receptiveness to Trump’s campaign overtures. At the advice of Sandy Luff, Sessions declined further meetings. 62. Moving on to Manafort, who worked on Trump Campaign from March to August 2016. Manafort was well connected to Russian oligarchs from his previous work (see his indictment & convictions for tax fraud and money laundering) and cultivated his contacts well into the campaign. 63. Manafort employee Konstantin Kilimnik, with deep ties to Russian intelligence, contacted Manafort about a proposed peace agreement that would enable Russia to control Eastern Ukraine. The agreement would require U.S. support to succeed. 66. Here, the report delves into Manafort’s deep Ukraine connections dating back to 2005, which explain his familiarity with Kilimnik and other Russians, and which are public knowledge b/c of Manafort’s indictment. 67. Manafort was recruited for the Trump campaign because of his deep connections with Russia, and for a while he worked for the campaign without pay. Rick Gates suspected Kilimnik of being a “Russian spy”, a view he shared with Manafort. 68. Manafort shared his campaign appointment with his Russian allies through Kilimnik, mentioning to Gates that this was “good for business” and would increase the likelihood that he would be paid $2m that he was owed for his campaign consulting work in Ukraine. 69. Manafort consistently shared, directly or through Gates, information and polling with his Russian contacts. This advanced his own business interests that go way beyond the issue of this campaign and have to do with his pre-campaign business dealings and financial situation. 70. Which brings me to a personal insight: The more I read this, the more I realize that the stuff you guys and I care about–civil rights vanishing, children in cages, planet protections evaporating, all the stuff we hold near and dear–this is just a SIDESHOW here. 71. This is not about the business dealings advancing a political appointment. This is about the political appointment advancing THE BUSINESS DEALS. Manafort is not a step toward Trump. He and his interests are the LYNCHPIN of this story. We’ve all been looking at this wrong. 72. Okay, back to the report. Manafort met Kilimnik twice during the campaign, and on both occasions the issue of the Trump campaign is mentioned as a sideshow to the business dealings and to the campaigns in the Ukraine. 73. Kilimnik cites Yanukovych (the ousted Ukrainian president) as an interested party. This illuminates Manafort’s briefings to Kilimnik not as focused on the U.S., but as using the U.S. election as a platform for the real issue, which is the proposed pro-Russian peace agreement. 74. Indeed, and this part is heavily redacted, but it seems that Manafort’s post-campaign activities relied on capitalizing on the results of the U.S. election to bring about the Yanukovych peace plan. 75. There is no conclusive evidence that Manafort brought the peace plan to the Trump campaign’s attention. Kilimnik, however, continued pressuring the Dept. of State about this well into 2018. 76. Shifting gears to contacts after the campaign. The day after the election, Hope Hicks is purportedly contacted by Putin. A few days later, Trump and Putin speak by phone, and Russian officials begin aggressively seeking inroads into the Trump administration. 77. Petr Aven, self-identified Russian oligarch, testified before Mueller team that there was a flurry of Russian activity and effort to get in touch with the Trump campaign, including outreach to transition team and to businesspeople connected with Trump. 78. This is consisted with a plan for U.S.-Russia reconciliation drafted by Kyrill Dmitriev, who heads Russia’s sovereign wealth fund, which Dmitriev argues was cleared through Putin. 79. The report section detailing Dmitriev’s aggressive efforts to insinuate himself into the Trump administration and advance the plan is heavily redacted. 80. Among other people, Dmitriev met in the Seychells with Erik Prince, who had financed the effort to find Clinton’s emails. Prince later conferred with Steve Bannon about this meeting, trying to introduce Bannon to Dmitriev and advance the plan. 81. The content of the Prince-Bannon communications cannot be verified because Bannon deleted them from his Blackberry. 82. In January 2017, Dmitriev met with Kushner’s friend Rick Gerson, and they developed a five-point memo on U.S.-Russia reconciliation. Point (3) is “developing ‘win-win’ economic and investment initiatives.” Gerson provided Kushner w/the document. 83. Subsequently, Dmitriev said the Trump-Putin phone convo “went well” and the document he had prepared “played an important role.” But communications btwn him and Gerson ceased as their investment plan went nowhere. 84. Kislyak also sought to meet Kushner after the election. Kushner was informed that in non-substantial matters, Kislyak was the person to talk to, and subsequently met him with Flynn at Trump Tower on Nov. 30, 2016. Kushner expressed U.S. desire to start afresh with Russia. 85. In December, Kushner met with Sergey Gorkov, manager of Russia’s government bank. Kushner described the meeting as diplomatic; the bank, as a business matter involving Kushner’s corporation. 87. Carter Page, who was no longer part of Trump’s circle, presented himself as such in Russia after the election, and met Deputy Prime Minister Arkady Dvorkovich, who expressed interest in a dialogue with the U.S. There’s more on this, but it’s redacted. 89. When Obama introduced the sanctions against Russia, Kislyak approached Flynn. Flynn first spoke with the transition team at Mar-a-Lago, and then with Kislyak, asking the latter not to escalate in response to the sanctions. 90. The next day, Russian foreign minister announced that Russia would not retaliate. Trump congratulated Putin on twitter for this decision. Kislyak told Flynn that their conversation led to this decision. 91. This concludes the facts before the cover-up. Now there’s a heavily redacted section explaining the choices in prosecuting Russian nationals about their role in the campaign (bots and hacking). 92. Now, to the Trump Campaign’s responsibility. The report analyzes this through the lens of conspiracy, which requires an agreement between two or more persons to violate criminal law. It finds that the multiple contacts in the report did not rise to that level. 94. Notable exceptions were Manafort and Gates, for whom there was ample evidence of acting as foreign agents. 95. As to campaign finance violations, insufficient evidence re Trump tower mtg, because:  insufficient proof that the campaign officials acted “willfully” (knowing the negativity of their actions) and  the value of the damning Clinton information is difficult to gauge. 96. There’s a redacted portion about possible First Amendment barriers to prosecution. I don’t understand why this is redacted. 97. Several people lied to the campaign about their meetings with Russians, notably Papadopoulos, Flynn, Cohen, and two redacted individuals. Regarding Sessions’ lies, the investigation did not find him “willfully untruthful” when omitting his meetings with Kislyak. 98. This thread covered Volume 1 of the report. I will now grab a quick bite before moving on to Volume 2 in a separate thread. Thank you for your attention – please retweet and share with anyone interested. Mueller’s report, obviously, is the counterpoise. 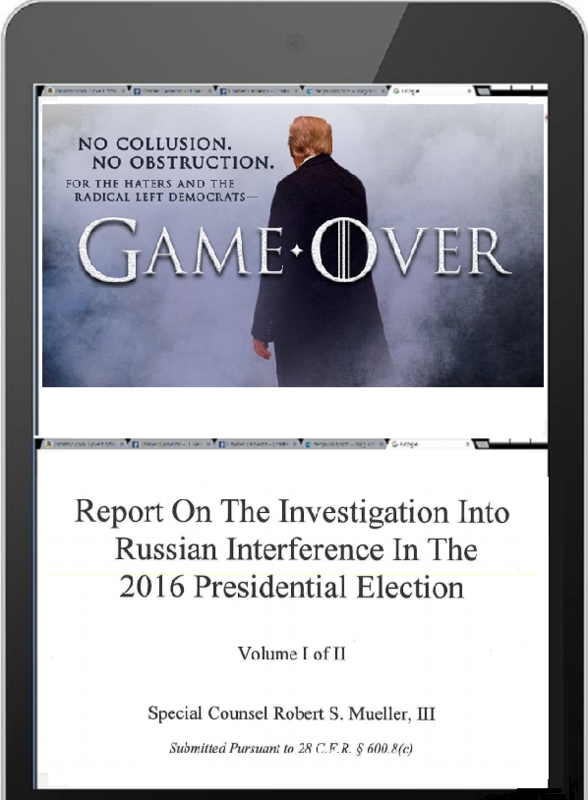 Posted in Charles Cameron, donald trump, Doublequotes, mueller | Comments Off on Game over? Report dropped..